Alzheimer's disease and related dementias have impacted my life and family a great deal. My paternal grandmother suffered from it before she passed, and currently my maternal grandmother suffers from dementia and is confined to a nursing home - not knowing who we are. 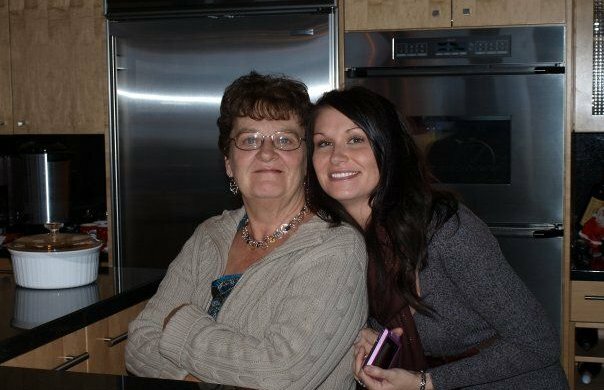 But most recently, my Mom was diagnosed a few years ago and sadly lost her battle to early onset Alzheimer's disease and Vascular Dementia less than a year ago (in November of 2013). She was only 65. She is the oldest daughter of my grandmother who is living in a nursing home. The part that breaks my heart is that my grandmother doesn't even know her daughter was sick and has passed away, and wasn't able to come to her funeral. These diseases are absolutely devastating to a family. Watching my mother change over the course of 3 years was so heartbreaking. Grieving the loss of your parent while they are still alive is still hard for me to wrap my head around. The last time I spoke with my Mom was the week of my 30th birthday in November. She was in the Foothills hospital after suffering a major seizure in October. We just sat there holding hands and I knew she had no idea who I was, but she smiled and said she liked me and I told her I loved her and that is probably the biggest peace of mind I can carry around with me. I love and miss my mother very much. She was the greatest Mom we could have ever asked for, she always put her kids first. I will always carry her heart inside my heart. This is my first year taking part in the Alzheimer Walk and Run. One thing my sisters and I hope to achieve by participating in the Walk and Run is to promote awareness that these diseases do not just affect the elderly. My Mom was only 65 but many years before there were small signs that we didn't catch on to and by the time she was diagnosed it was only a few short years until she passed. It means a great deal to me to honour my mom’s memory and to know that the pledges I raise will help create life-changing tools and support for thousands of local people just like my Mom.